Any discussions involving aspects of digital marketing campaigns such as conversions, traffic and links is really centered on marketing analytics and measurement, since that’s where the data comes from. Without the metrics, we wouldn't know how many people visited your site and the number of them who converted into customers. Marketers and businesses would be operating in complete darkness, essentially guessing based on biased perception. Billy Beane (watch Moneyball to learn about Beane's tactics!) doesn't assemble his baseball teams without looking at the stats, and by the same token, you don’t want to start your digital campaigns without a thorough understanding of marketing analytics. Whether it's putting together a Marcomms Plan, or working out what's the best strategy to enter a new market or grow your market share then often a vital place to start is with some in depth Competitor Analysis. WSI not only has some unique proprietary tools to help you get a clear view of what your competitors are doing right now, and what approach you might take to achieve your business goals but we can help you establish a comprehensive set of KPIs (Key Performance Indicators). Why are KPIs important? Well, as you implement your strategy, it is important that not only do you benchmark your performance against your own business goals, but also have a clear view of your benchmarks against your key competition too. Most operate not in a 'static market place' but one that is changing fast, and your clients or customers will be constantly comparing and contrasting you and your brand against the competition. So this market intelligence is vital if you are going to succeed, but unlike years ago where this type of analysis sometimes took the resources of a whole department, we can work with you to create a simple yet comprehensive report, monthly, quarterly or as often as you as a team need it. Not information for information sake, but rather a succinct analysis that allows you to make sensible investment and management decisions based on fact, rather than guesswork. What's the Cost of Competitor Analysis? At a glance, you can see how well your website is doing overall against your competitors - what you need to improve, what you're already doing well. In this example, the website has a lot of problems that aren't obvious. 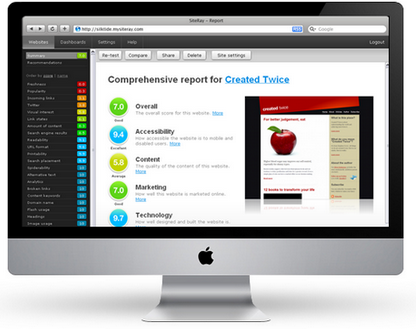 We can create a dashboard and show you how well your website stacks up against your competitors. So you can track over time that the improvement that your web developers (and marketing team) are making are delivering against the competition, and also keep an eye on the investment and progress your competition are making (this is all part of good reputation management). The comparison view allows you to compare detailed results for two websites, or even for the same website at two different times. If you have several websites, you can compare one site against another. Normally we charge £500 per website but if we are comparing your website and up to 4 of your top competitors then we apply a 50% discount and if you want to repeat the benchmark (say every 6 or 12 months) to track your progress with your website improvement and online marketing (including Social Media) then we charge just either a half day rate £565 or a full day £995 depending on the level of detailed benchmark you require. To find out more call 204-294-9974 now and ask to speak about competitor analysis. This fantastic Proprietary Tool is used in a number of ways, and when used as a stand alone service costs circa $500 per website, because it's analysis and output (in the form of an actionable task and activity list) is just so valuable to business owners and web developers alike. For some example extracts from the WSI Webscan report scroll on down the page. For further information or to arrange your WSI Webscan report today,contact us now. At a glance, you can see how well your website is doing overall - what you need to improve, what you're already doing well. In this example, the website has a lot of problems that aren't obvious. This example test looks at how visually engaging each webpage is, and even highlights the best and worst pages for you. Ideal for finding issues in new websites you don't have time to fully explore. This example test looks at how people on Twitter are talking about this website, and how the official Twitter account for this website is being used. As you can see from the left hand side there are a full range of comprehensive tests, with the detail below each leaving with you as the business owner or marketing director with all the information you need to assess and take action. You can even use the recommendations as a simple task and activity list to direct the work of your web development team, whether that be internal or external to your organisation. Contact us today to arrange yours.